The O’Brien siblings, Quinn, Callum, and their sister, Teagan, are the fifth generation of O’Briens involved in Riley O’Brien & Company, an iconic denim dynasty based in San Francisco. Although their father is still nominally the head of the company, he has been sidelined with colon cancer. Quinn is the acting CEO, and his responsibility is a heavy one. A diminishing appeal to women has seriously eroded Riley O’Brien’s market share, and the company that once held the undisputed top spot in the industry has a serious problem. Quinn is feeling the pressure. He resists his sister’s push to make major changes in the women’s division and even considers cutting the division. Amelia Winger is a Texas girl with an economically and emotionally impoverished background and a dream as big as her home state. Although her formal training is limited, she is a talented designer, and thanks to the showcasing of some of her designs by her life-long best friend, a rising country music star, she has had some success. But her big break comes when Teagan O’Brien approaches her about designing a line of accessories for the women’s division of Riley O’Brien. 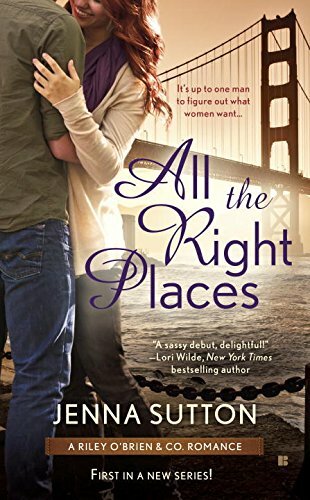 Amelia doesn’t realize until after she arrives in San Francisco that Teagan has a much bigger project in mind as well. She plans for Amelia to redesign Riley O’Brien’s jeans for women as well as adding new styles and expanding the market, none of which Quinn is to know about until the samples are ready. If Amelia produces designs that persuade Quinn to make the changes Teagan wants, Teagan will invest millions in boutiques that offer Amelia’s designs. Although she is ambitious and believes in her work, Amelia is unhappy about lying, and her unhappiness increases when she meets Quinn. The attraction between them is strong from their first meeting, and, despite their separate determination that a relationship between them would be unprofessional and unwise, the attraction intensifies. Of course, eventually passion wins--again and again, and soon hearts are involved. But just as the HEA is a heartbeat away, Quinn discovers that Amelia has lied to him. Can he forgive such a betrayal? 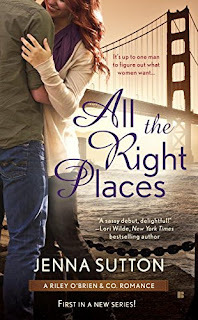 All the Right Places is the first book in Jenna Sutton’s Riley O’Brien & Co. series. The premise of the series—a family trying to preserve the legacy of a jeans company that is as American as Coca-Cola and that has endured even longer—is promising, and although Quinn is rather too much the alpha hero for my taste, I know such heroes have a large audience, and he is an interesting character. I found Amelia more sympathetic, even though her self-deprecation was too much at times. The cast of characters also includes some intriguing secondary players. I liked Quinn’s brother, Cal, and Amelia’s best friend, Ava Grace, and wanted more of both, but I actively disliked Teagan. The concluding chapter did little to change my mind. Sometimes when I read a book that I have agreed to review by a new or new-to-me author, I think that I’m just not the right audience for the book. That may well be the case with this one. It is not a badly written book, and Sutton clearly displays strength in some of her characterization. Overall, I found it a novel that failed to fulfill its promise. However, readers who like their romance with a high sizzle factor, are unbothered by tonal inconsistencies, and don’t object to an overly generous use of the F word may like this book much more than I did. I appreciate your honesty as well.